A beautifully designed app, Atom in a Box HD will strongly appeal to anyone looking for an interactive tutorial in quantum mechanics. The subject of this app is the hydrogen atom—specifically, the many states (and there are many—2,109 in all) of its atomic orbitals. 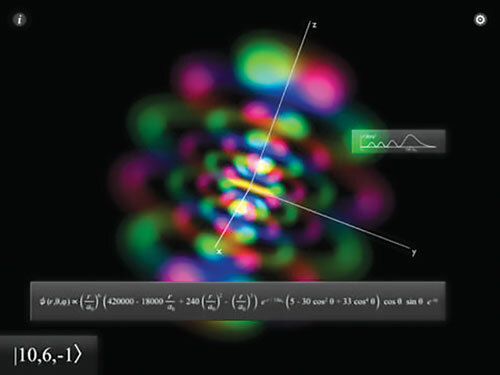 For any user-specified state (or “eigenstate,” to use the technical term), the app will calculate and display the mathematical form of the wavefunction, the probability distribution of the electron, the energy of the electron, and the corresponding Schrödinger equation. As you may have already guessed, this app can be somewhat inaccessible to those whose understanding of quantum mechanics is a bit rusty. There is an accompanying online tutorial that gives a good introduction to many key concepts, but it certainly still helps to have some prior knowledge if you hope to really take advantage of this sleek, educational app.